Prior to the 1989 revolution in the Czech Republic which led to the fall of their communist government, the breeding of German Shepherd Dogs was predominately that of working dogs. What is unique is that this breeding has revolved around one kennel, owned by the Czech Army's Pohranični stráze (Border Patrol). The Kennel z Pohranični stráze (z PS) was founded in the year 1955 for the only purpose of production and training of the dogs that would be solely used for the protection of Czechoslovakian People's Republic's, since 1968 Czechoslovakian Socialist Republic's borders. The most of the dogs were acquired from the territory of former East Germany and also there were dogs from Czechoslovakia used for breeding, the ones that excelled in their character qualities. The stud dogs, females and puppies were taken care after by military service conscripts. 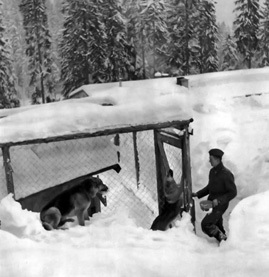 The dogs had been trained at the Kennels for about 12 months and afterwards relocated to Border Patrol training facilities in their quarters (nowadays they're located in Czech police training facilities). The breeding program, established in 1956, has been under the direction of Mr. Jiri Novotny since 1981, who is also the director of training. The breeding program has been since the foundation focused mainly on strengthening the good power of bones, dark pigmentation, strong nerves and willingness to work in tracking, obedience and defense work. While the kennel name remains ""z Pohranični stráze" , it is now under the Pohranični Policie (Boarder Police). 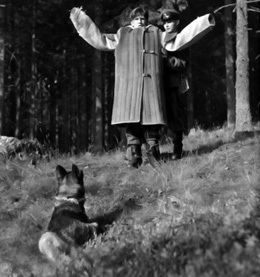 During the years under the communist regime, the Czechoslovakian boarder patrol and their dogs would apprehend 20 to 30 people on a daily basis. While nine out of ten people would give up when confronted, the dogs were regularly called upon to defend their handlers from those intent on crossing the boarder at what ever cost. Today the Czech Boarder Police share boarder stations with their German counter parts who maintain a tight control over economical refugees from former Eastern Block entering Germany. Those who are not given visas to legally enter Germany attempt to cross this same Czech boarder. While many are crossing to seek a better life in Western Europe and usually do not resist arrest, an increasing number are connected with organized crime and are pose a considerable threat. The "z Pohranični stráze" German Shepherd Dogs continue to be called upon to respond daily in high risk, threatening situations. The training courses to prepare them are likewise demanding as are the requirements for breeding. There are three breeding facilities with a total of 80 breeding females that make up the ""z Pohranični stráze" kennel. There are 30 stud dogs, all of which are on active duty with their handlers. The breeding facilities are located within the Czech Boarder Police compounds in Domazlice, Libejovice and Prackovice. These compounds have high security status with access to them strictly forbidden to anyone, including Czech Boarder Police, who do not work at the specific facility. Obtaining a " Pohranični stráze" German Shepherd Dog; There are three ways in which quality dogs from this highly desired "Z Pohranični stráze" kennel are available. I. Studs Fees: The "z Pohranični stráze" kennel breeds their females occasionally to dogs owned by civilians. The stud dogs chosen are outstanding working dogs selected for their ability to consistently produce dogs with exceptional working ability. The owner of the stud has the option of being paid or taking a puppy for payment. Most people take the latter option in order to own a dog with the kennel name "z Pohranični stráze". II. Whelping litters: There are three kennels of which the Z Pohranicni straze kennel works closely z Jirkova dvora, Jipo-Me & z Blatenskeho zamku. These kennels, owned by civilians, are at times given the opportunity to take Pohranicni Straze breeding females and whelp the litters. In return, these private kennels keep half of the litter which bears the kennel name "z Pohranični stráze". III. Dog for dog: There are also times in which z Pohranični stráze Kennel trades dogs with these three kennels as another way to bring desired dogs and bloodlines into the Pohranični stráze breeding program. Through these three ways in which civilians have had access to z Pohranični stráze dogs the kennel has managed to be at the center of breeding in both the former Czechoslovakia and the present day Czech Republic. Many of these dogs have been purchased by Schutzhund competitors in both Western Europe and the United States, often placing high at championship events. Most of the above article was written by Mr. John H. Whittaker, Bellmont, Massachusetts, and the information was acquired from Mr. Jiri Novotny. GSD dogs imported from Czech Republic & Slovakia are the "Old School"-type German Shepherd Dog. Training decades for war, "Si vis pacem, para bellum" (If you want peace, prepare for war) the Pohranični stráze dogs were used to combat smuggling, invasion, thugs/mafia and riots. 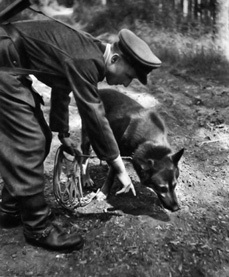 Primarily specializing in tracking, handler protection, and obedience, these dogs excelled because of the DDR and Czechoslovakian bloodlines. This created more intelligent, healthy, large boned, big headed, and darker dogs for the military. Imagine tracking a fugitive through cold, inhospitable weather, for days, then being shot at and having your dog defend you and bite the criminal. The ZVV/SVV Titles for the dogs emphasized the above aspects, as well as crawling towards the target in a battle situation. Now we have the media, lawyers, and people who don't know anything about a Police K-9, ruining the German Shepherd Dog, as it was re-created for the protection of Czechoslovakia. Social, detection dogs are the new-breed of Police dog. Ignorance, lack of training (laziness), and the Dollar have created a "new" type of Police dog. Police are now beginning to utilize single purpose patrol and single purpose detection dogs for liability. This is as should be. These dogs can concentrate on their prime task, and do it better than the dual qualified dogs. The best trainers have talked to me about this separation. The price factor is the same as the training of a dual purpose K-9, for having one patrol dog and one detection dog. This would translate into more dogs on the street, and assigned to calls that they specialize in. Many of the fine dogs from the Pohraniční stráze and Polícia bloodlines serve Foreign Special Forces, and also individuals and families for personal protection. There is no other superior dog which would be better used for this purpose. . 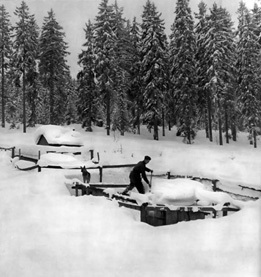 Easily adaptable to any climate, surroundings, and possible hostilities, the German Shepherd Dog from the former Czechoslovakia is stronger, more intelligent, and discriminating than any other type of dog for this work. I would not fear when putting my life in the trust of a Pohraniční stráze dog. 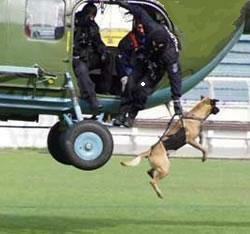 No AK-47, 911 call, or martial art training will replace the GSD K-9 who will always get the Bad Guy.